What is Galicaster Totem-KIT (GaliTotem-KIT)? Galicaster TOTEM is semi-mobile recording unit, ideal for multipurpose rooms, temporary setups or facilities with mobile elements. Galicaster TOTEM is built with a standard 14U rack and a wide touchscreen installed on a pole, so that the unit can be used while standing. This is all installed on a wheeled base, making the whole structure mobile. 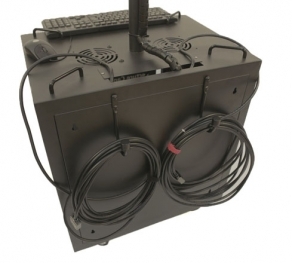 The rack has enough room for the Recorder itself (GaliRACK2-DVI) and auxiliary hardware, such as an audio board, audio processor(s), video scalers, video splitters, wireless stations for peripherals, etc. Therefore, with the right equipment, Galicaster TOTEM can be seen as a compact mobile mini-studio. Two 10m VGA or DVI (VGA-in & VGA-out) cables are included and can be hoocked to the rear of the unit. The unit may be placed next to the speaker, where they can operate it directly with a minimum impact on the lecture or speech. Otherwise, an external operator may be monitoring the unit (in this case, possibly from the audience’s standpoint). Mobile capture unit in contiguous classrooms. Setting up all (or many) rooms with a complete recording system may not be affordable in some cases, and record all the lectures in the same classroom may not always be possible. Instead, the same Galicaster TOTEM unit may be shared accross different rooms that are close to each other, thus saving installation costs and making a better use of the space available. 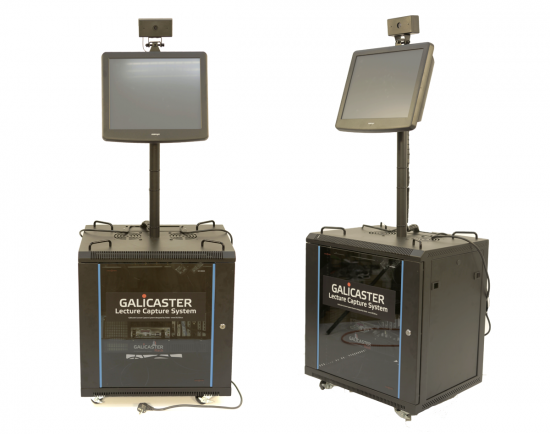 A mobile unit such as Galicaster TOTEM is specially useful on practical Medicine training, since it can record from several cameras synchronously (which may later be used as supplementary material) and display them to the audience at the same time. GaliClass-KIT can be connected to an Opencast Matterhorn cluster, thus providing a full remote scheduling system as well as automatic uploading, enrichment and publishing.